Tom Curran (born on 12-March-1995) is a South African-born English cricketer who plays for Surrey. 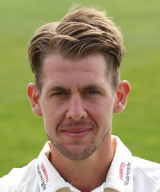 Thomas Kevin Curran is a right-handed batsman who bowls right-arm fast-medium. Curran was selected for the England Performance Programme squad in September 2015. He received his maiden call-up to England national squad on 28 February 2017 for the tour of the West Indies, as cover for Jake Ball.